Flexible connectors are used to absorb thermal and seismic movement, absorb hydraulic shock, provide vibration and noise dampening, ease installation and correct minor misalignment of piping and components. They come in a variety of sizes, materials, and connection ends for numerous applications. 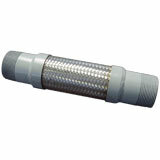 The inner hose is an annular (bellows) design. An annular hose is better suited for pump connections because it can better sustain torsion stress due to longitudinal expansion from rises in pressure. Metal wire braid on a hose assembly restrains against hose elongation under higher pressures and acts to dampen vibration. A heavy braid also increases abrasion resistance. Optimal braid coverage will contain the core under pressure and reduce the possibility of twisting and squirming. The use of braided metal connectors for applications such as pumps, compressors and other mechanical equipment can enhance the overall operation of a system.